What is the Local Savings Card at Nature’s Corner? It is a FREE SAVINGS CARD entitling you to fantastic healthy savings! 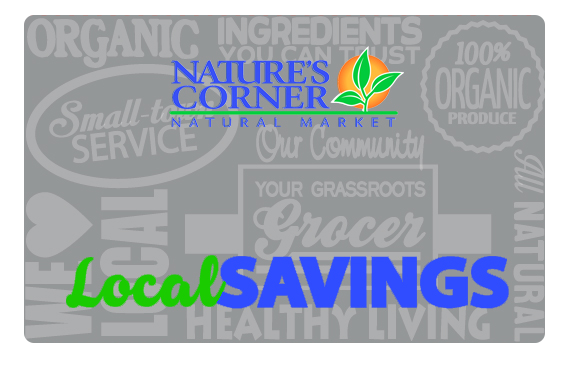 Come into Nature’s Corner Natural Market and present your Local Savings Card at every time of purchase. You will receive up to 50% OFF all SHELF TAG products that are ON SALE in the store every day! Every 1st Thursday of the month, you’ll save up to 35% OFF ALL your Nutritional Supplements & Vitamins! Wild Weekly Produce Specials! Every week a different variety of ORGANIC FRUITS & VEGETABLES that are ON SALE every day! Weekly Community Specials! Every week a different variety of GROCERY ITEMS that are ON SALE every day! For the Local Savings Card APPLICATION FORM, please click here.